When I first heard the buzz about OMG Tacos via Twitter, the name alone piqued my interest. 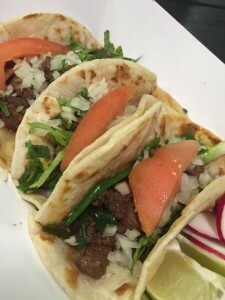 The newest taco shop in Richardson off 75 North opened almost two weeks ago. My friend and I stopped for a visit to see what the hype was all about, and we definitely left on a happy note. The stop is located just down the street from the popular hookah place, Jasmine Cafe (a past-time favorite of mine). The space had an industrial feel to it, with tin trash cans, rustic picnic tables for seating and warehouse-type flooring. Three TV were mounted on the walls showing sports games, and we listened to rap and pop music in the background. The fast-casual restaurant is distinct in a way that the menu is simple. The menu screen you see below is all that’s offered. 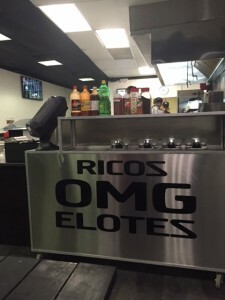 OMG Tacos a great spot to grab a few low-cost tacos that are made in just minutes, and satisfying your hunger right away. Appetizers include a cup of Elotes, chips and salsa and a side of grilled onions and jalapenos. 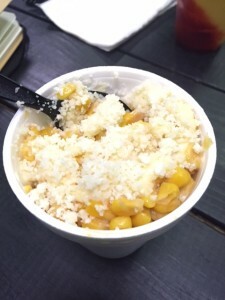 In my opinion, the Elotes, served in a Styrofoam cup, could have used a little bit more cream (yeah, I know that’s extra calories), but the portion was generous and could serve two people easily. If sweet sauces is your thing, definitely get the chips and salsa. The salsa’s sweet flavor was savory and likable. Plus, this starter only costs only a buck. Select from six taco on the menu: steak, chicken, pork, beef tongue, beef and the special OMG Taco…more about that later. Ranging from $1.49 to $1.99, the tacos are cheap yet full of meat. You can choose from flour or corn tortillas, and I opted for a mix of both as you’ll see below. My favorite taco was the steak since it was so tender and juicy. 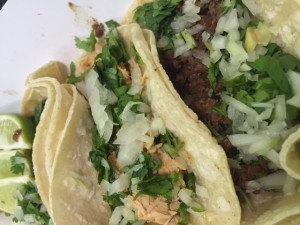 All the tacos were packed with meat and only come with two optional toppings…onions and cilantro. So no shredded cheese, sour cream, diced tomatoes, etc. The simplicity brings back the theme of a very basic, yet filling, taco concept. Mild, hot and guacamole sauces are available at the counter for some added flavor. 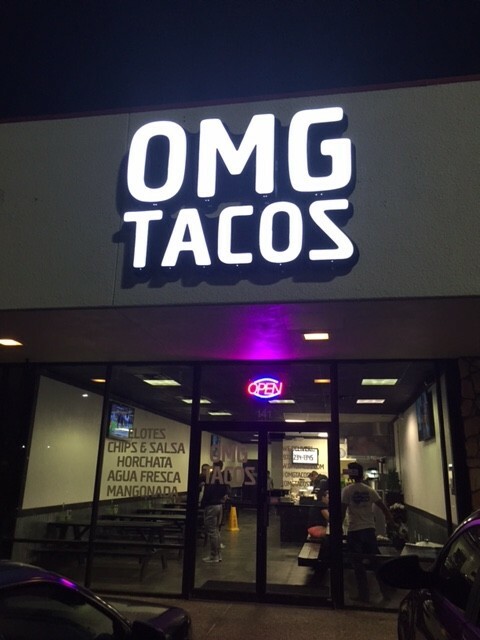 The OMG Tacos are just like the steak tacos but comes topped with a slice of tomato and a housemade secret sauce. I didn’t get to find out what made up the sauce (darn! ), but it tasted a little smokey and a little sweet. I think the sauce will make or break it for you on this one…for me, I loved it! 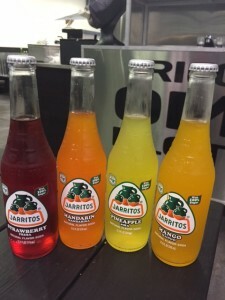 Guests can choose from water, soda, fruit drinks and bottled beer to enjoy with their tacos. Additionally, I highly recommend getting one of the housemade slushies.The Horchata (back slushie, below) reminds me of a Chai tea latte and a sweet dessert drink. The sweetness comes from the almond milk, and the drink is topped with cinnamon spice. The iced Mangonada drink comes with red sugar-coated candy stripes and tasted like mango with a bit of a spicy kick to it. 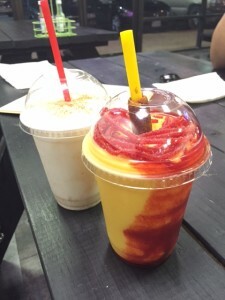 Both were refreshing, but I enjoyed the Horchata the most! 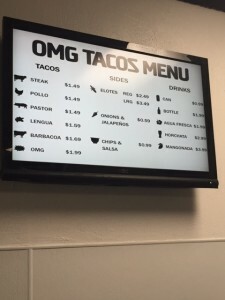 OMG Tacos is located at 141 N Plano Rd, Richardson, TX 75081. They are open seven days a week from 11 a.m. to 3 a.m. (that’s right – past bar hours!). They also offer free WIFI. Check them out on Facebook and Twitter for more information.